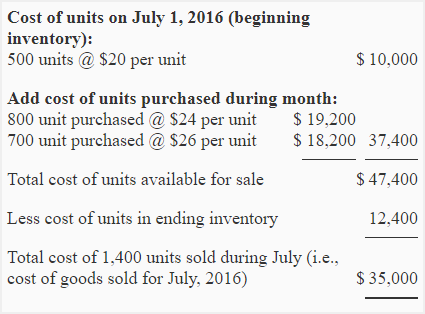 July 01: Beginning inventory, 500 units @ $20 per unit. July 18: Inventory purchased, 800 units @ $24 per unit. 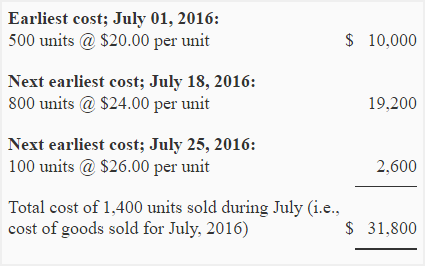 July 25: Inventory purchased, 700 units @ $26 per unit. The Delta company sold 1,400 units during the month of July. Which of the methods mentioned above will yield the lowest figure of the gross profit in the income statement? IT DEPENDS ON THE PRICES CHANGE OF INVENTORY (GOODS PURCHASED , LABOR WAGES FRIGHT & SHIPMENTS CHARGES , COMISSIONS PAIED …ETC) DURING THE ACCOUNTING CYCLE + VOLUME OF TOTAL SALES . Hi Arslan, we have an exercise that answers your question. Thanx a lot now I have got simple way of calculating the inventory. Will there be a change in the unit cost if there is purchase return or sales return? Thank you very much for your work it has made me understand. amazing, i really understand clearly now…. Limitless thanks to you, it is a unique lesson. how did you get ending inventory with regard to fifo..? Stay inafrmotive, San Diego, yeah boy! Does the presence of a sales return or purchase return affect the results? 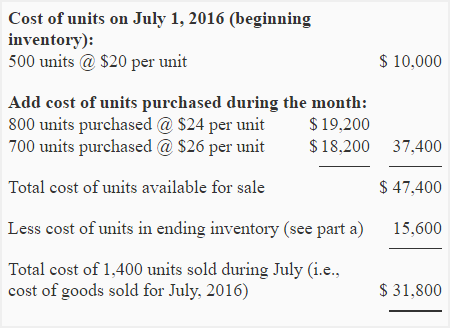 Units from July 18 purchases. Under LIFO, the units are assigned cost using earliest prices. 500 units @ $20 per unit and remaining 100 @ $24 per unit. This was great, however most questions I am coming across need to be answered via spreadsheet work. Do you have the solution on video as an excel spreadsheet solution by chance? 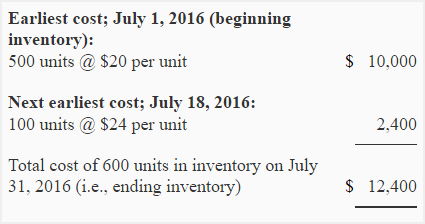 Under FIFO, we assume all units (600) in ending inventory belong to July 25 purchases. and total units is=600…based on this is the average cost going to be …3.30 or 3.31 or 3.32 or 3.33 which one is correct in such situation? I thought the LIFO is last in first out. shouldn’t we start at the last or most recent purchase? why are we starting at the 500 units? Because the most recent purchase means that it is the Last In, so it means that it should be out first. So the most recent purchase (Last In) is first in manually computing the Cost of Goods Sold. which one is suitable for trader??? ?